Product Description: This kit will automatically lockup the torque converter on a 700 R4 transmission, without need of a computer. This type of torque converter lockup system is often used when an older, non computerized engine, is hooked up with a newer computer controlled transmission. The lock-up will occur in fourth gear and has the capability of locking up the torque converter in second and third gear, say for towing. The kit includes a wiring harness, a replacable transmission solenoid as shown by the arrow on the left, the electrical connections, and directions. Product Description: This product comes as a kit connected into the 700 R4 torque converter lock-up system. It is used to control the lock-up time, based on the vehicle speed, between 30-90 mph. This kit eliminates lock and unlock cycling and premature or unwanted lock-up, which in turn, may reduce or avoid engine lugging and spark knock after getting into 4th gear. The dial control shown on the left is used to adjust the speed in mph of lockup. Product Description: The transmission dipstick is a flexible, braided stainless steel indicator to check the level of transmission fluid in the 700 R4 transmission. There is also a mounting bracket with holes to connect to the bulkhead. The lower end fits directly into the transmission and is sealed with an O ring. There are several lengths so make sure the right length is purchased. Product Description: This shifter fits on top of the 700 R4 transmission and includes the shift handle, shift knob, neutral safety switch hook-up, shift connection to the transmission, with a Park, Neutral, Reverse, Overdrive, Drive, 2 and 1 gear selection. The yellow arrow to the left shows the rod which mechanically operates the shift lever going into the transmission. The entire shifte mechanism is bolted to the sides of the transmission. Product Description: This transmission cooler is a finned aluminum oil cooler. It is designed so that it can be located remotely from the transmission, in a variety of locations on the street rod. The location should be in an area which has sufficient air flow around it to keep the transmission fluid cooled. Appropriate hoses allow the transmission fluid to flow from the transmission, to the cooler, through the cooler, and back to the transmission. It has bolts which slide in a slot for ease of installation. 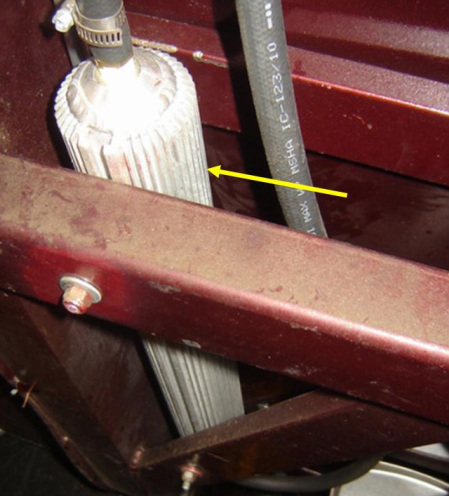 This particular application has the transmission oil cooler located between frame support, slightly back of the transmission. Other types of transmission coolers are placed in front of the radiator to cool the transmission fluid. Under normal conditions, the transmission fluid should be about 40 degrees Fahenheit higher than the coolant in the cooling system. Product Description: The neutral safety switch is located as part of the automatic transmission shifter assembly. It is shown in the photo to the left as two electrical connectors directly below the shift lever. See yellow arrow. Note that a light blue and a purple wire connects into the neutral safety switch from the wiring harness. This switch is used to make sure the engine cannot crank or start when the transmisison is in gear. It is critical when building a street rod, that this switch is installed as soon as possible, to eliminate having someone accidently start the engine in gear. If this were to happen, and there was a person in front of the vehicle, they could be seriously hurt.